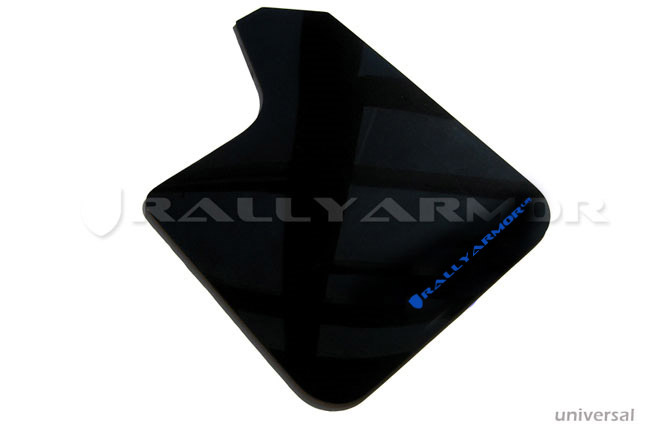 Rally Armor's Universal UR rally mud flap is ideal for vehicles outside of our application specific flaps. For users seeking lasting, shock resistant and flexible flaps that will provide effective coverage against road debris, mud, snow and tar, this is an ideal urethane alternative to generic mud flaps (hardware is not included). Great for customized projects, the Universal URs are a durable construction intended to survive the harshest environments. Generous width at slightly under 12" and 15" of height, the Universal flaps fit most makes and model years. Avoid extra work cutting, the Universal UR flap is shaped to provide inner wheel well clearance and eases the modification process. Fabricated from the same urethane used in our model specific Subaru, Mitsubishi, Mazda UR rally mud flap applications, the Universal URs flexible characteristics make it the ultimate mud flap for extreme conditions. Set includes 4 universal urethane mud flaps for each side of your vehicle (two left and two right) with a blue Rally Armor logo. Due to the extensive variety of vehicles, hardware is not included. Simply source hardware and create the mounting points flap to fit your vehicle.